Phosphoric acid is the most important basic product in phosphorous chemical egineering industry. 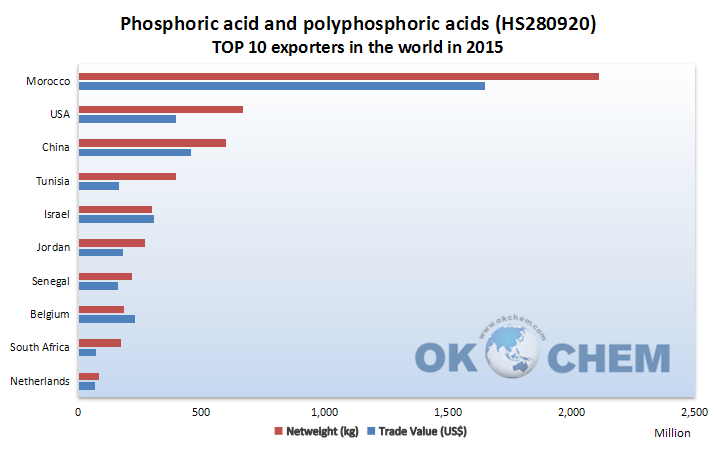 In 2015, the import volume of global phosphoric acid and polyphosphoric acids (HS280920) reached 6.2 billion kilograms in 137 countries and regions; India, Turkey and Netherlands became the top 3 importers. 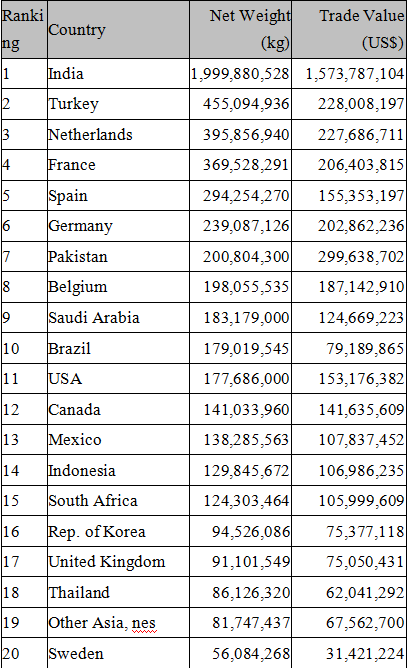 In the same year, the export volume of global phosphoric acid and polyphosphoric acids(HS280920) reached 5.5 billion kilograms in 78 countries and regions; Morocco, the USA and China were the top 3 exporters, counting for 61.77% of global total export. From the above figures, we can find that Morocco is the top 1 exporter of phosphoric acid and polyphosphoric acids, taking 38.57% of global export, followed by the USA with 12.22% and China with 10.98%. However, China had higher export trade value than the USA. The picture also indicated the global phosphorus ore resource distribution and potential. 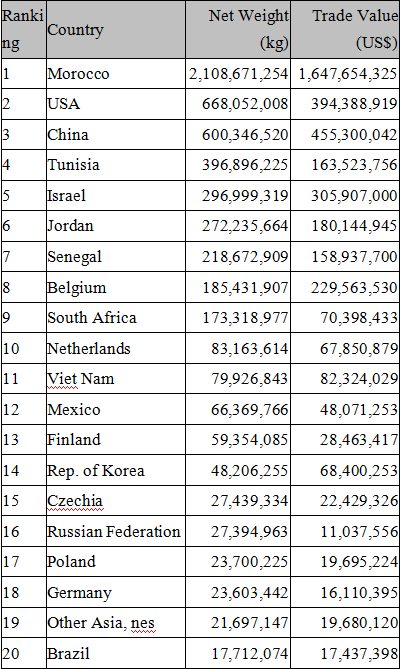 The basic reserves of phosphate ore in the world, according to United States Geological Survey(USGS), are 50 billion metric tonne and the global economic reserves are 18 billion metric tonne, primarily in 60 countries and regions of Asia, Africa, Middle East, North America, South America. 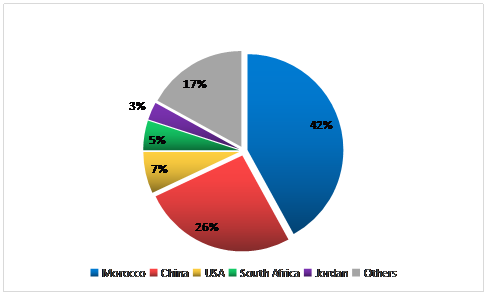 Morocco, the phosphate kingdom of the world, is the the world’s top 1 holder of phosphate ore with 42% of the world reserves and approximately 40% of world export volume, followed by top 2 China with 17% of global phosphate ore reserves and the top 3 the USA with 7%.